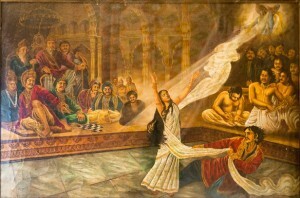 Yudhistira bets his wife Draupadi in the game of dice and loses her to the Kauravas. Dussasana drags Draupadi to the assembly hall in front of everybody. And there, the Panchal princess is subject to the cruelest humiliation while her husbands sit still with their eyes shut and heads hung low. The Kuru elders, Bhishma, Drona, Kripa and Dhritarashtra also sit and watch the inhuman behavior of their descendants without raising a single voice of protest. Listen to this exciting episode to know what happens next.